A recycled model from a new brand, the xTerra FS220e elliptical trainer will look strangely familiar. If you have seen the Spirit and Sole models that this trainer is descended from, you have an idea of its overall appeal. This trainer has an easy-to-read blue backlit LCD console display and features 6 pre-set programs, 2 manual, and 2 heart rate controlled programs. This machine is very much like its 2010 cousin model, the Spirit Esprit EL-255. 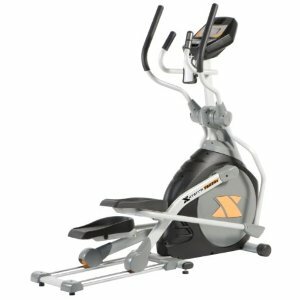 Like the Esprit, the xTerra FS220e elliptical trainer features concave wheels on single chrome rail, and it has the same natural elliptical feel and elegant design as the Spirit, although you might not like the prominent orange-and-grey detail on the console; that is going to look dated by next month. This Dyaco product is modeled on the best-selling Sole E25 and Esprit EL-3 ellipticals – which is a selling point - however, it then begs the question: why buy the xTerra when you can get a Sole or Spirit elliptical trainer at the same price, or close to it, with better warranties (3 years parts), a more attractive console and a heftier frame, and more features? The reviews on the xTerra FS220e tend to emphasize the “cons” to this model, such as the poor quality speakers and weak fan, and the limited one-year warranty on parts. The xTerra FS220e would not make our list of “Top Five” elliptical trainers priced at under $1000. At $899, it doesn’t have the warranty and other attractive specs to match the Spirit Esprit models, the EL-355 (20" Stride) or EL-255 (18" Stride) both priced at $889, or a rear-drive model such as the Yowza Largo. We certainly would not suggest going with this 155-lb model over the 189-lb Sole E25, which has been on most Best Buy lists for several years now. The value of the xTerra is reasonable, but since you have such a wide choice of ellipticals when shopping on the internet, you might want to research the Spirit, Sole, Yowza, and even Lifecore models more closely, and see why they are a better bet than the xTerra FS220e elliptical trainer.